January: wow, look how long my dreadlocks were! This series of photos was inspired by this blogger, whose suggestion to take self-portraits in the kitchen really resonated with me. 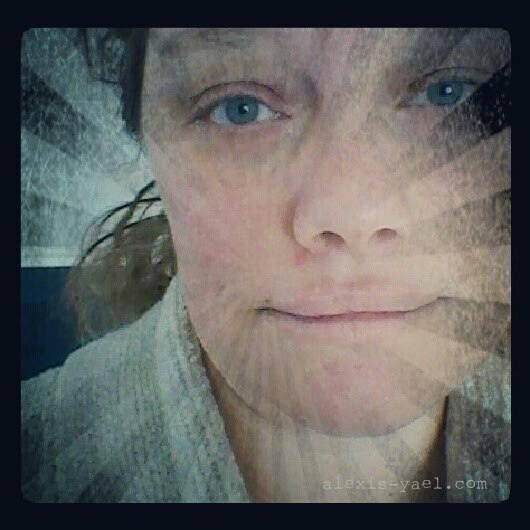 February, my (former) nemesis: A melancholy, dreamy self-portrait taken in my favorite (silk) kimono. Well, my only kimono. Remy and I went to California during February and that was a really great trip for both of us. Healing in ways that didn't become clear to me until later. March: I cut off a foot and a half (or so) of my dreadlocks. Lighter and happier, yes. And then we got sick. Oy. I lost a lot of the hearing in my right ear. It was not so fun, but we got through it. April: my new dslr came and with it an awesome new gadget: a remote control (an off-brand, bought separately). Mid May: on the way to Remy's birthday party (he's in the car seat behind me, I can sort of make out the book he's reading, I think. Although that may be something else. iPod photos, not very clear. 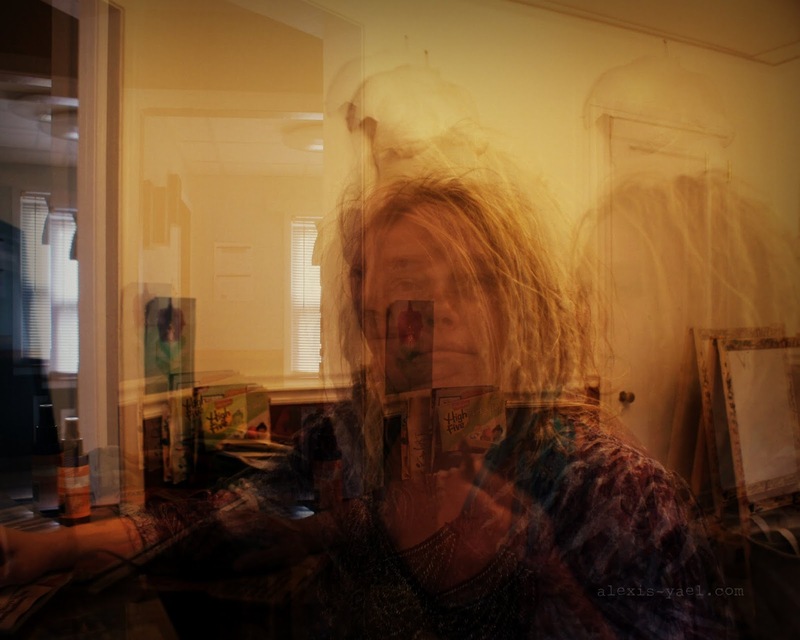 June: triple exposure (which I was playing around with a lot in the summer). At my desk. July: on my way to Drake's Beach with my friend Sh (she was driving). In California for my first alone trip since Remy was 2.5 (which was also to California, go figure). The henna was a treat to myself I got in Portland. I love henna. I asked the artist to start with a flower and add vines and just let her imagination go wild. Love. August: an early morning Saturday photo shoot with Remy. (Note the blue hibiscus muumuu - it's a Hilo Hattie's that I picked up for a song at a NJ thrift store with the tags still attached. Love.) I am not a morning person, so sometimes I get out my camera and take photos to help me wake up. Sepember: we went to Connecticut on our anniversary weekend. I love the beach. And I really love traveling. And I really, really, really love traveling with my family. October: Amanda gets me back in the hoop with her hoop-enthusiasm - at least until the hurricane, then with houseguests my enthusiasm waned... and then we were traveling and then I got sick... but I will get back in the hoop again sooner or later. November: haiku-a-day-ing, traveling, spinning. It was a whirlwind of a month. Sometimes you just have to laugh. And tomorrow, we begin a new year. 2013. If you are even half as excited as Remy is, you will be very excited indeed. May you shine forth into the new year, wabi sabi and awesome. The mud and the lotus, both.